1-Minute Bible Love Notes: Jesus Calling: Are Sarah Young's Claims Biblical? 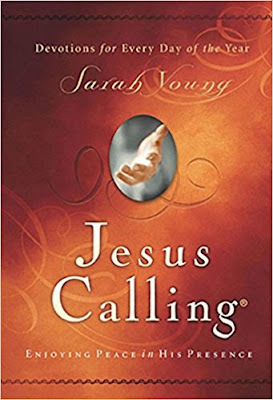 Jesus Calling: Are Sarah Young's Claims Biblical? I have been asked to give my perspective on the extremely popular book Jesus Calling written by Sarah Young. I have chosen not to evaluate specific content of Young's books although I give a brief summary at the end of this article. Instead, I will evaluate Young's claim that she writes the words Jesus speaks to her. Most Christian authors, myself included, would like to think that what we write is prompted by the Lord. I know my writing often flows from time I spend with the Lord. But Young does not simply claim inspiration. She claims to be writing down the words Jesus speaks to her, and she claims the "I" in her books is Jesus speaking. Below, I have used Young's explanations of her method from the foreword to Jesus Calling 2004 Edition because certain facts about Young's method were deleted or amended in newer editions. I have used excerpts instead of the full text because the foreword was quite long and contained a great deal of background on Young's life that is not directly applicable to this discussion. But I have taken care to share these excerpts in context. Even though Young's remarks about God Calling were removed from later editions, Young clearly credits God Calling as the inspiration for her method of writing. 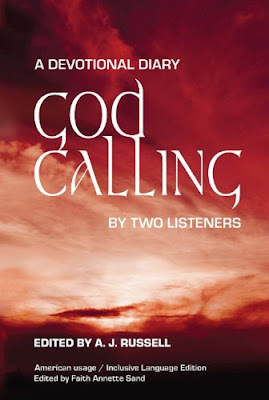 God Calling, published by A.J. Russell in 1935, was said to be written by two anonymous women who also claimed that what they wrote came directly from God. However, things they wrote sometimes contradicted Scripture. 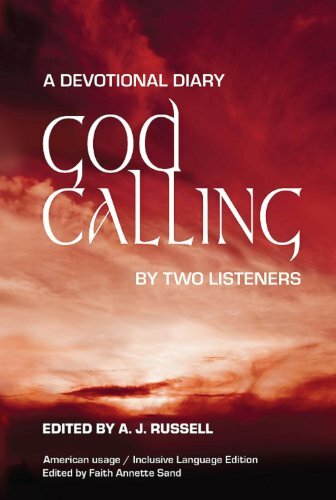 Despite its popularity, God Calling has always raised concerns in Christian circles. Taking Young's claims about God Calling out of the foreword in editions after 2004 may have helped to avoid some of the controversy surrounding Young's methods, but it doesn't change the fact that Young was deeply influenced by this book. Why did Young long for more than the words of Scripture? Is there something we need to know that isn’t found in Scripture? Is there anything that can bring us more comfort, peace, assurance, instruction, or guidance than God’s divinely inspired Word? Hebrews 4:12: "For the word of God is alive and active. Sharper than any double-edged sword, it penetrates even to dividing soul and spirit, joints and marrow; it judges the thoughts and attitudes of the heart." 3. "I wanted to hear what God had to say to me personally on a given day." Throughout Scripture God gives His children specific guidance for their particular situations (e.g. Abraham: Genesis 12:1; Ananias: Acts 9:10-15; Cornelius: Acts 10:1-6; Peter: Acts 10:9-15; Paul: Acts 16:9-10, Acts 18:9-11, 2 Corinthians 12:1-6). It's appropriate for a group/church/family to seek God's guidance for specific decisions. And it's important for individuals to ask God's guidance for things that are not directly addressed in Scripture. We should pray about what job to take, which person to marry, where to live, and even about insignificant decisions in our lives. God wants to direct our thoughts and show us His specific plans and purposes for us as individuals. But if we are looking for truths about God's love, if we are looking for hope, peace, encouragement, correction, comfort, etc., Scripture is our most reliable source. We don't need new words from God. I'm glad that Young makes this distinction because it's an extremely important one. But it doesn't change her claim that she is writing messages from God. What are the spiritual disciplines of the Christian life? This answer may vary, but everyone would agree that the most essential disciplines are Bible study, prayer, fellowship, and obedience. But Young feels writing down the thoughts Jesus dictates to her – something never mentioned in Scripture – is a better tool for increasing intimacy with God than the disciplines mentioned in Scripture. Young’s emphasis isn't biblical. If I were to critique the content of Jesus Calling, I would summarize by saying that it does not balance sin and grace, encouragement and correction in the same ways that Jesus balanced these things in Scripture. This would not be a problem if Young were simply writing a book of encouragement, but she is claiming to speak for Jesus 365 days a year. However, as I stated at the beginning, this article is not written to critique the specific content of Young’s books. I am examining her claim to write words of Jesus not specifically found in Scripture. There is nothing wrong with unique and innovative ways of sharing God's truth, but to claim that the words we write are His words is a dangerous practice. A more accurate and honest title for Young's book would be: Things Sarah Young Believes God Would Like to Tell You. 1. Despite Young’s claims, the words in her books are hers, not Christ’s (unless she quotes Scripture). 2. Everything in her books, just as everything written by any other human author, should be tested against Scripture. 3. Neither Jesus Calling nor any other book with a human author can bring the same quality of truth, comfort, guidance, and assurance that Scripture brings to us. Note: While Young's newest book Jesus Always maintains the same voice and format, her introduction to the book is more acceptable. I'm sure she has changed her explanations based on criticism. But readers still need to be careful to understand the three points above when they read a book written in the voice of Jesus. Young not only makes this claim to speak words of Christ in the foreword of her book, but she permits it in every description of her book on major publishing sites. "After many years of writing in her prayer journal, missionary Sarah Young decided to listen to God with pen in hand, writing down whatever she believed He was saying to her…written from Jesus' point of view, thus the title Jesus Calling." 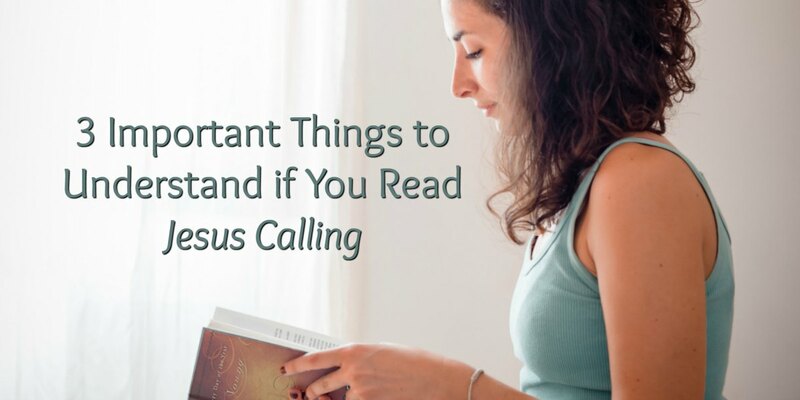 When I published this article in May 2018, I thought the above articles were the best resources available, but in June Randy Alcorn published an article that may just be the best one I've read: Some Concerns About Jesus Calling. Really? I'm not critiquing but if I was I would say... How disingenuous. The whole point of this article is not to critique but to criticize. I think none of us has the right to judge, make comment or question what happens between Sarah Young or anyone, for that matter, and God. I don't believe I am alone in having many times wished to hear personally from God. Not to replace scripture but to enhance, expand and clarify. So, the fact that Ms. Young found writing down what she believes Jesus says to her helpful is not as scandalous or unbiblical as the author intimates. Ms. Young never advocates replacing Bible study with any other method of communing with God. She never advocates, nor says that her writings are as comforting, truthful or assuring as the Bible is. In fact she never compares her writing to the Bible at all. 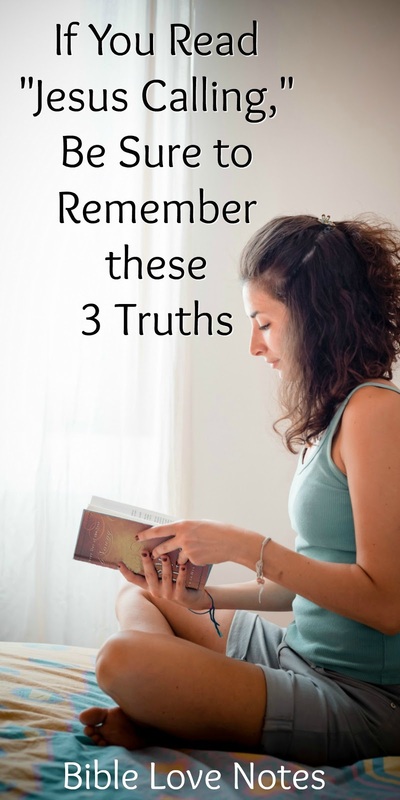 She does, however, use scripture to illustrate the connection of what she writes to the truths, principles and themes of the Bible. Everyday I hear pastors, and even lay persons say, "God told me to tell you" or "Jesus laid it on my heart to share with you" so how is this different from what Ms. Young does with her book? Just because these others don't relay their message in the first person does not mean that what they are doing is not the same as what Ms. Young is doing, relaying a message that she believes was given to her from Jesus. I think that this article finds fault where there is none, I believe it is unkind, unnecessary and unchristian; I think it is, to quote another popular writer, Much Ado About Nothing. It's a popular belief that we are not supposed to judge anyone or anything, but it's not Scriptural. I encourage you to read the long list of Scriptures in my article titled "How, Who, and What to Judge According to Scripture." However, if you do feel it is wrong to judge, then I am wondering why you have judged me and my article saying they are "critical," "unkind," "disingenuous," and "unchristian." Is that not judging? If you read this article carefully, you will find that I disagree with Young's methods and claims, but I have not called her names or judged her character. You have explained Young's methods as you see them, but your explanations are different than Young's explanations. Wow! Thank you very much! I have a good friend that reads those books faithfully and I have another friend that writes poetry, saying Jesus wakes her up at 2 or 3 (etc.) in the morning and speaks these poems to her and she writes them down.I always secretly wondered about the last friend mentioned and the poetry, but I dint want to offend her, so I've kept quiet. Thank you very much! Excellent blog and conclusions! This is a topic with which I have also been concerned, and have even written a book expressing my thoughts from a biblical perspective, "Snatched from the Jaws of the Lion." My unique background and experience as the daughter and granddaughter of spiritists, allowed me to identify the issues you wrote about regarding Sarah Young’s writings. As a young Christian from a pagan background, I too struggled to discern truth and now am passionate about communicating that truth to others. Thanks again for your thoughtful comments. Thank you so much for sharing this. Someone in my life is very into Jesus calling. I had always had a caution in my heart about the title of God Calling and Jesus Calling. It's very dangerous to read books anyway, other than the Bible (even some translations of the Bible are scary) but the seductively sweet luring of the underlying message of her book is deceptive. It makes you think that these are the divinely inspired Words of God. If she merely used scripture with the same attitude, it could be taken out of context too. The enemy is so cunning! We have to be vigilant! Thank you for being like Ezekiel, a watch"woman" for the flock of Jesus Christ. Bless you sister! Thank you for tackling some of these hard topics and for being willing to share truth no matter the "flack" you may receive. Truth is truth and God's Word speaks for itself. Thank you for bravely stating these unpopular concerns! Thank you. One must stay in the Word (Bible), to know the truth. Thank you for speaking. God bless you! Excellent article. And very fair and balanced perspective on a very important issue. No matter how one views Scripture, claiming to write the words of God or Jesus is claiming words that are on par with Scripture. Do not stifle the Holy Spirit. Do not scoff at prophecies,  but test everything that is said. Hold on to what is good. Stay away from every kind of evil. I have never read her book & I didn't think you were being judgmental, just discerning her claims against scripture truths. On a similar note, My Mom signs the 'trinity's' name on her paintings by using 3 dots. This bothers me for some reason that I can't quite articulate - like it's forgery on some level - but not with bad intentions by my Mom. I just don't 'feel' right about it in my heart.